Every season is Festival Season! Can we tempt you? 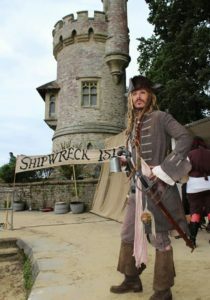 Many towns put on a colourful festival especially during the summer, with musical, historical and dancing themes – here’s a few to consider including in your travel plans. May Day in Hastings is a unique, dynamic and very exciting day out for first time visitors and veterans alike. Tens of thousands of motorbikes roar into town for the annual May Day Run from Locksbottom in Kent. And, the Jack in The Green folk festival welcomes the Spring with, dancing and music shakes off any winter blues. On May Day up to 40,000 motorcycle enthusiasts, visit the amazing spectacle that appeals to all the family. A fantastic display of motor bikes glisten from the pier all the way to the black Fishermen’s huts at Rock-a-Nore. 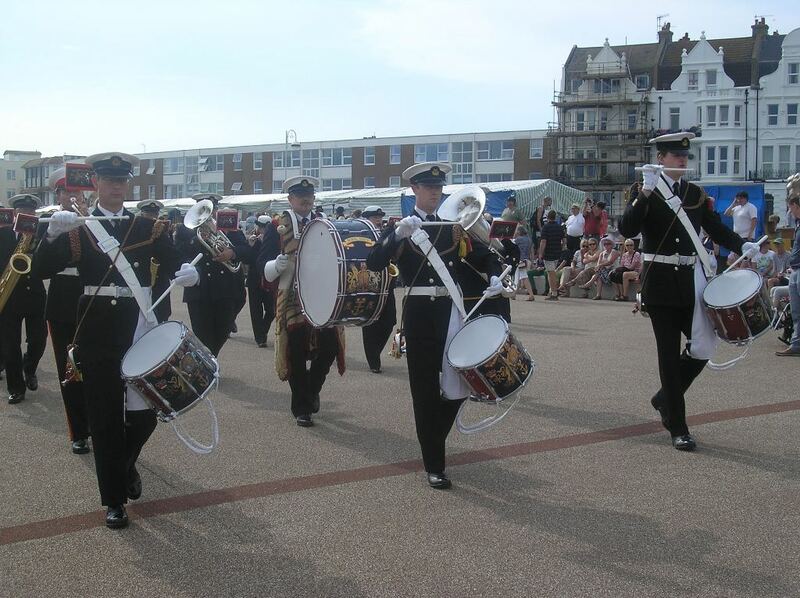 At 10.30am Jack In The Green parades through Hastings old town to West Hill by the castle. Face-painted people in amazing costumes sing and chant to the beat of drums groups, while Morris dancers compete for titles. At about 3pm the giant Queen of the May is slain. After that, the revellery moves back to the Old Town to watch the bikers head home before the setting sun. Hastings on Mayday is a unique experience that once enjoyed is never forgotten. 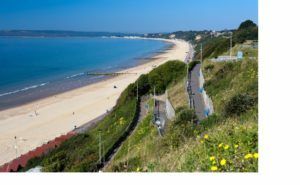 The Isle of Wight Festival of the Sea 2017 launches on 1st July coinciding with the spectacular round the island yacht race that sees 1600 yachts take part. In Ryde, the Isle of Wight Mardi Gras, taking place the same day. This year’s Mardi Gras theme celebrates the 70th anniversary of the Independence of India. The festival will mark the links between Queen Victoria, who lived at Osborne House, and India. As Empress of India she employed Indian servants on the island, including Abdul Karim, who became her friend and teacher. 2017 brings world class jazz from 11th to 12th June. Supported by Arts Council funding there’s live jazz in retail outlets and events in pubs, clubs, bars and restaurants. The festival opens with a Family Jazz Concert at The Lighthouse in Poole on the Sunday 11th featuring BBC Radio 2’s Jazz presenter, Clare Teal and the Guy Barker Hollywood Orchestra playing popular jazz. The festival caters for all tastes and ages; with a Jazz Tea Dance at Beales store with the Bournmouth Symphony Orchestra Dance Band. For young musicians there’s a Jazz Stars of Tomorrow event at Bournemouth University. The unique travelling Jazzmobile, will bring live jazz to everyone from Boscombe to Poole. Jazz FM will be broadcasting an evening of music from the festival which closes with a major headline concert at The Lighthouse in Poole on 17th June. 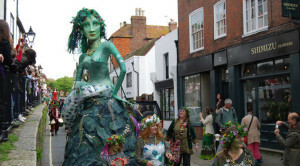 The picturesque Dorset market town of Wimborne Minster annual Folk Festival runs from 9th to 11th June this year. This family friendly event has a great programme including a parade of Morris dancers, folk and clog dancers, all dressed in colourful liveries and accompanied by musicians. Children follow the parade and jig along to the music. This year several rapper sword dance teams will perform in the streets and in the pubs around the town. Rapper is a dance that developed in the mining areas of Northumberland and Durham using flexible metal swords with wooden handles. Within half a mile of the town centre is a camp site; for a few pounds you can book your plot and stay for the weekend. If you need a hand to find your way around the town centre the road train drives visitors round the festival for free to make sure they don’t miss anything. 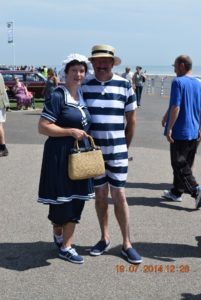 Bexhill’s 1920’s Day Festival is on July 22nd. 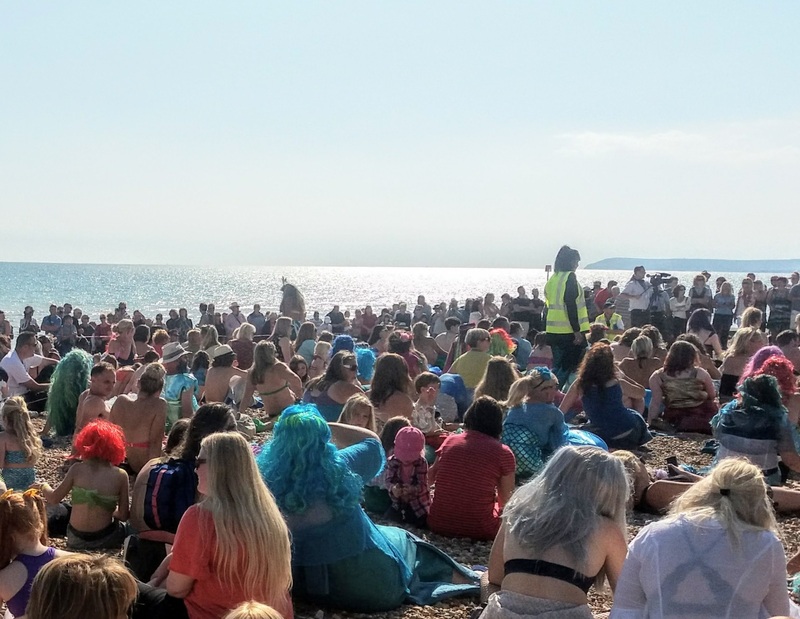 In 2015 Bexhill held the Guinness World Record for the most people dancing the Charleston – part of a huge themed event on the sea-front and town. In 2017 Bexhill took the record back! Dress up (this happens a lot in Bexhill), learn the steps and get dancing! Bexhill dancers are practising for the next record breaking attempt. Thousands of visitors in 20s attire makes a wonderful spectacle enhanced by prohibition stunt action in the Town. There’s also an Air-show and a classic car display. Bexhill’s famous Classic Cycle Group will be sporting their tweeds and showing off their penny-farthings and butcher’s bikes. Anyone can join in; there are lessons on the morning, or just go along to watch. Take your beads and your fringes, bob your hair and have a ball! The town also holds the Guiness World Record for the most mermaids on a beach at one time. The record was set on the 2nd September 2017 and here they are! The May Day Bank Holiday weekend each year sees Ely’s Eel Festival take place and the next event is timed for the weekend of 28th April to 1st May. The festival celebrates everything to do with eels and starts with a Parade on the aptly named Eel Day. The colourful spectacle continues with eel throwing in the city’s market square (no eels are harmed as stuffed toys are used!) A focus of the celebration is tasting this food that used to be a staple of the Fens, and from smoked and jellied eels to inspirational new dishes there’s much to sample including wacky new recipes such as Eel and Apple Crumble and Eel Fudge! On Sunday and Monday a Food and Drink festival takes place on the Palace Green with food from a host of artisan traders and cookery demonstrations. For further information Festivals are a great way for visitors to discover a town. If your town is having a festival this summer, why don’t you tell us about it? takes place from 27 – 30 July featuring contemporary and traditional folk arts from the UK and beyond. The line-up includes the entertaining Australian Spooky Men’s Chorale, the mighty Oysterband, award winning Goitse (Ireland) and Gaelica (Venezuela), the first folk-comedy night and an evening with DJ and war correspondent Andy Kershaw. There are also ceilidhs, more for families with circus skills, storytelling, theatre and crafts, plus a programme of workshops spanning music, song, arts and even star gazing! Tickets cost from £19 for a concert or from £107 for the weekend. Previous PostShrewsbury – It’s not just Black and White.